There is the tale that is told: A desert queen journeyed north with a caravan of riches to pay tribute to a king and his One God. The story of a queen conquered by a king before she returned to her own land laden with gifts. The truth is far more than even the storytellers could conjure. The riches more priceless. The secrets more corrosive. The love and betrayal more passionate and devastating, both. Across the narrow sea, the pillars of the great temple once bore my name: Bilqis, Daughter of the Moon. Here, to the west, the palace columns bear another: Makeda, Woman of Fire. To those I served as priestess and unifier, I wore the name of my kingdom: Saba. 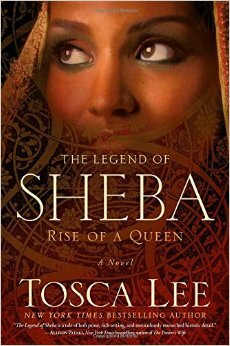 To the Israelites, I was Queen of the spice lands they called Sheba. They also called me whore. I have been all and none of these, depending who tells the tale. Across the sea in Saba, the mountain rains have ceased by now, the waters of the mighty Dhana turned to steam on the fields at dawn. In a few months the first traders will sail in the quest for incense and gold . . . bringing with them news of the king who sends them. I have not spoken his name in years. I never meant to become queen. My mother, Ismeni, was born under the glimmer of the Dog Star, when men become disoriented by its light. They said she enchanted my father, that he made her his consort with a clouded mind. Drowsing on her sofa in the hot afternoon, I would twine my fingers with hers and admire the rubies of her rings. I hoped my hands and feet would be as slender as hers. It was all I hoped; it never occurred to me that any other aspect of her beauty might be granted a mortal twice on this earth. But my greatest treasures were the songs she sang like lullabies murmured against my ear. The ritual prayers she taught me as we knelt before her idols, the sweet waft of incense clinging to her hair. Beyond the palace, Saba sprawled from the sheer edge of the coastal range to the feet of the desert wastes. But I was content that my world stretched no farther than my mother’s chamber. Before I could ask what she meant she slid a heavy bangle off her wrist. It was as wide as my hand and crusted with rubies. “Do you see these stones? They are harder than quartz or emeralds. They do not break under pressure, or soften with age. Let this be a reminder, my dove, that wisdom is more lasting and therefore more precious.” She slid the bracelet onto my arm. Ten days later my mother suffered a seizure and hit her head on a marble bench inside her bath. That day I was told she had abandoned me for the afterlife, taking my unborn brother with her. I screamed until I collapsed against the edge of her table. I called them liars and begged to see her, flailing against anyone who tried to touch me. My mother would never leave me. When they took me to her at last, I threw myself over her, clutching her cold neck until they pried me away, strands of her long hair still tangled in my fingers. Hagarlat, my father’s second wife, was neither young nor beautiful. But her presence in the palace renewed ties with the tribes to the north, and control of the trade route through the immense northern valley. If the dams and canals that channeled the summer monsoons were the lifeblood of Saba, the incense route was her breath, every exhale of her roads profitably laden with frankincense, bdellium, and myrrh. I was eight when my half-brother broke the peace of the women’s quarter with his angry wail just before the first rains of spring. I distrusted Hagarlat. Not because she had the face of a mottled camel or even because she had brought the squalling thing that was my brother into the world, but because she had usurped my mother’s chamber along with her jewels and made the name Ismeni seem a distant thing in the minds of everyone but me. I went that evening without supper, but I had no appetite. I had seen young friends of dead unions become the servants of the offspring who replaced them before. One day I strode boldly into Hagarlat’s chamber, where she was dictating the celebration to take place for my brother’s first birthday. “Where are the things my father sends for me?” I demanded. I heard the intake of breath around me, saw from the corner of my eye the horrified expression of my nurse, the bolts of dyed cloth and rare silk laid out across the settee. Hagarlat turned, astonishment scrawled as clearly across her face as the henna on her forehead. Green jasper dripped from her ears. I avoided the palace as much as I could after that. I escaped to the gardens and lost myself by the pools, where I hummed my mother’s songs. Lost myself, too, in study with the tutor my father assigned to me when no one else knew what to do with me. Within three years I had devoured the poetry of Sumer, the wisdom writings of Egypt, and the creation stories of Babylonia. I called on the palace scribes and read court documents over their shoulders when they would humor me. Sadiq was a serpent—a fat man with a languid gaze that missed nothing and a knack for convincing my father’s advisors of his usefulness. The maidservants and slaves gossiped often about him, saying he had been born under a strong omen—which really meant he had come into considerable wealth with his sister’s marriage to my father. It seemed half the palace was taken with him, though I could not fathom why. “I wouldn’t be surprised if Hagarlat asked your father to give you to Sadiq,” my nurse said one evening after tut-tutting over my unkempt hair. Shara, the closest thing I ever had to a sister, stared at her mother and then at me. There, in the arched doorway of our shared chamber, stood Hagarlat. The hem of her veil was pinned back from her face, a rainfall of gold fell from each ear. I rose to my feet. The instant she was gone, my nurse and Shara turned toward me as one, their faces pale, nostrils flared with fear. “Bilqis,” he said with a sigh. I raised my head even as he looked away. The lines around his eyes seemed more pronounced in the low lamplight of the chamber, the characteristic kohl missing from the rim of his lower lashes. I jerked away from him. “Do you not see that she hates me?” I stumbled back, away from the low dais and into the pool of lantern light before the throne, but stopped when I saw how he stared at me. “Ismeni . . .” he said faintly. His hand lifted, fingers trembling in the air. I went to him again but when I tried to clasp his knees he flinched away. “It is late,” he said, eyes turned toward the latticed window. Torchlight glowed up from the royal gardens below. “It is settled.” The lamp flickered and I saw it then on his face: the grimace of the years since my mother’s death. Love eclipsed by the dark moon of pain. I quit attending meals in the hall. I began to avoid my lessons. The sight of him, from the way he wore his ornamental dagger high up in his belt as though it were his very manhood to the number of rings on his fingers, repulsed me. I would feel different in time, my nurse assured me. But my only comfort was that I would never be alone with him until we married in three years. Sadiq, however, was not a man of honor. I wanted to rise only to walk into the desert waste until the sands consumed me, but had no will even for that. As night came on the fourth evening, I called for my nurse. I would ask for the night shade that Hagarlat used to dilate her pupils. Or for the honey of rhododendron nectar. I couldn’t speak. Could not bring myself to give voice to the words. “Will he? They will ask you, ‘Did you cry out? Who heard you? When I claim you tried to seduce me and voice concern about your honor, whom do you think they will believe?” And I knew he was right: he was brother to the queen and master of waters. I was the daughter of a woman born under a bad omen, too often alone. I should have been filled with righteous fury. I should have accused him before my father if only to escape him—and any other man, as no man would marry me without a hefty bribe after that. Instead, I was overcome with shame like the rot of worms beneath the skin. The rains came and I kept to my bed. The torrents swept down the hills through the afternoon, carrying trees and earth and any building in their way into the wadi ravines. For now, at least, I was safe; the master of waters was away from the palace, monitoring the floods and the condition of the canals with a labor force ready to repair any breach in the sluices. Sometime before dawn, I rose and walked to the window. I was a wisp beneath my shift, having lost the young curves I had only begun to come into. Clasping the sill, I threw open the latticed shutter. As I had on so many nights since my mother’s passing, I sought out the Sister Stars. But that morning the moon obscured one of them. I stood at the window long after the sky had brightened and the stars began to fade, watching it pass before their company. Later that day, men came rushing into the courtyard, their shouts rising to the open window of my chamber. Sadiq’s body was never found. A month after his death, Hagarlat accused me before my father. Her face was drawn, her clothing hanging on a frame grown gaunt. I had grown into my own gowns once more, as though I had acquired the lushness she had lost in her grief. I turned on her with a hiss. I was like the branch, no longer green, that splinters beneath the weight of a single bird. I was prepared to be reckless, to curse her, her son, and every hoped-for issue of her womb, and every tenant of her tribe with their camels and goats down to the last rabid dog. I, who had no power, did not need to utter a word. She had lost all supremacy over me. And in that moment, she knew it. I watched the color drain from her cheeks. That fall I boarded a ship with my tutor, a retinue of priests, new ministers for the growing colony, and a wealth of incense, offerings, and gifts for the temple in Punt. I was not allowed to bring my nurse or Shara with me—Hagarlat had seen to that—and so bid them both tearful goodbye, kissing their necks and commending them to the gods. KEEP READING! Click here to purchase on Amazon. Special sale–$1.99 until March 15! Tosca Lee is the critically acclaimed, New York Times bestselling author of Iscariot; The Legend of Sheba; Havah: The Story of Eve; Demon: A Memoir; and The Books of Mortals series with New York Times bestselling author Ted Dekker. She lives in Lincoln, NE. For more about Tosca, please visit www.toscalee.com.